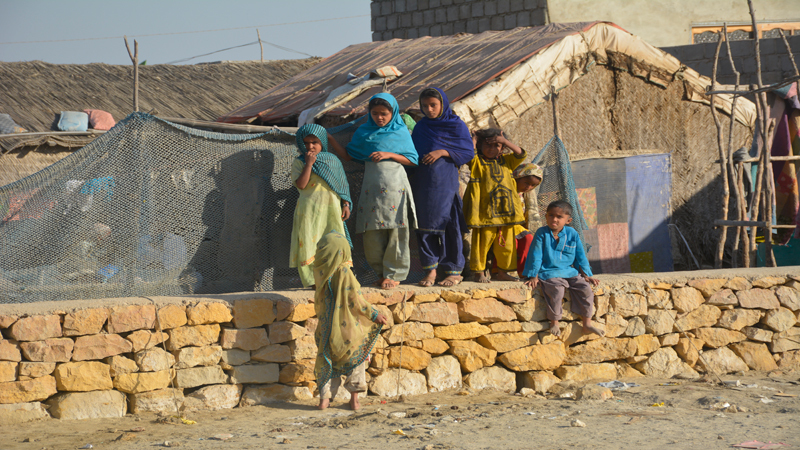 KARACHI: Sitting outside a ramshackle hut made from gunny bags and a cloth sheet, a 38-year-old fisherman, Umer Dablo fondly recalls the childhood days e spent in a hamlet on a remote island near Turchan creek in River Indus delta in Thatta. But in the last two decades, things changed drastically for Dablo and his family. Freshwater stopped flowing into the creeks so the fish disappeared, the villagers, unable to find water and fodder for their cattle, gave their animals away and even the mangrove trees, which used to serve as breeding grounds for fish, shrimps and other marine life, began dying. To make matters worse, in the absence of gusty flows of River Indus, seawater began submerging the islands near the estuary of the river. “We constructed raised platforms on our islands, so that we may sit when seawater submerges our homes, but with the passage of time, the water level increased,” explains Dablo “during high tide, it was not possible for us to cook. Minor children playing in seawater were falling sick,” he continues. Two years ago, when six out of the 13 families residing in the hamlet moved, Dablo also decided to move elsewhere . One day, he packed some of his belongings, took his wife and seven children, sat on a boat and reached Keti Bunder from where he took a Suzuki pickup and reached Karachi’s Dabla mohala, a coastal settlement between Rehari Goth and Chashma village near Ibrahim Hyderi. Dablo’s uncle and two brothers still live at his native village, as they are unable to afford migration. 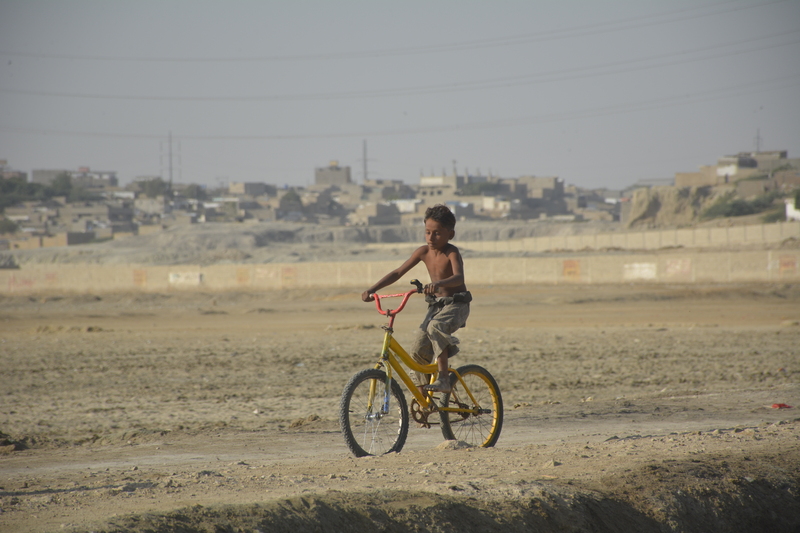 Umer Dablo’s new destination, this small settlement along Karachi’s coastline, is considered a colony of climate migrants. 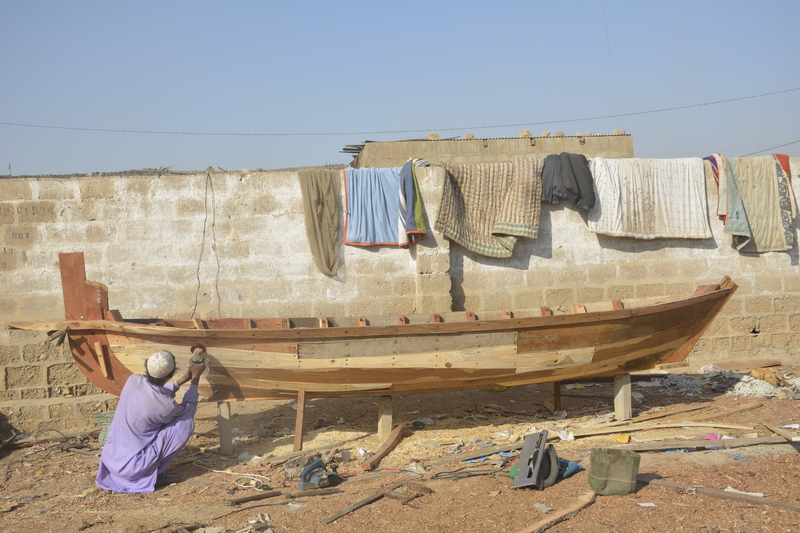 Most residents of Dabla mohala moved to the settlement when the rising sea levels claimed their native villages. According to Global Climate Risk Index 2017’s Long-Term Climate Risk Index (CRI), Pakistan ranked at number 7 among the countries that are most affected by climate change globally. 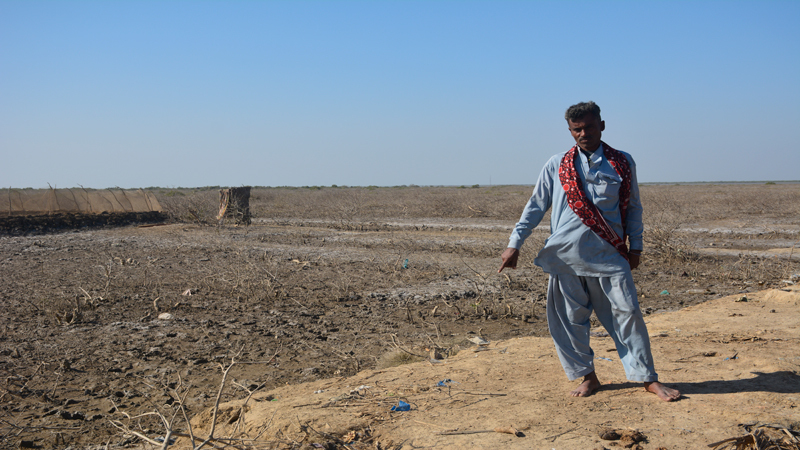 “The reducing flow in downstream Kotri has destroyed the River Indus delta and many of the traditional hamlets and villages were submerged. 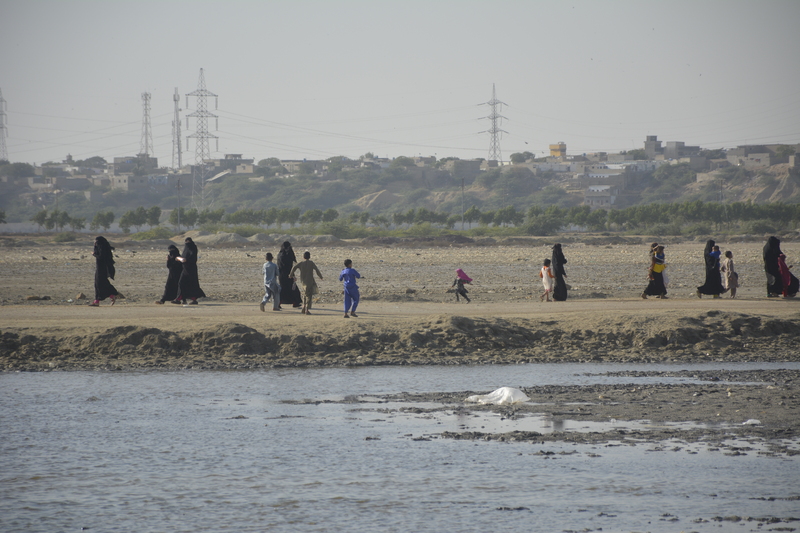 Approximately a million people were uprooted from these villages since 2000 and they moved to either Karachi or other districts of Sindh and Punjab,” explains Pakistan Fisherfolk Forum (PFF) chairman Muhammad Ali Shah. 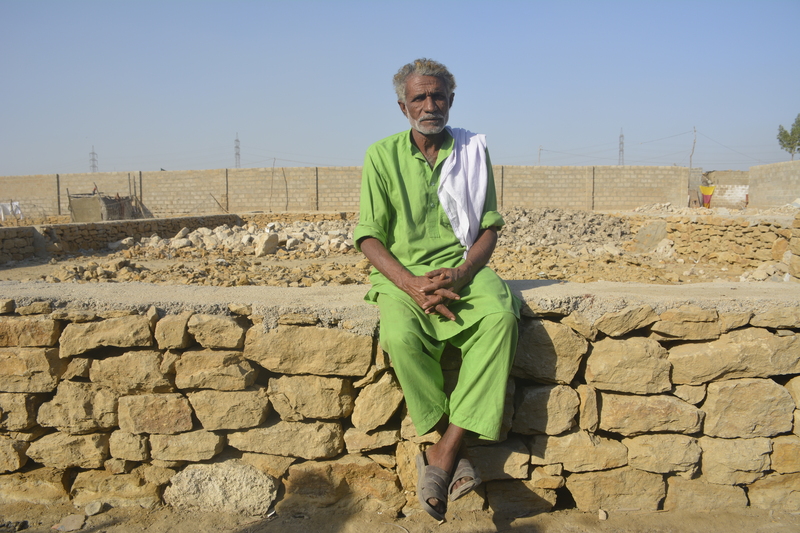 After moving to Karachi, Dablo constructed a makeshift hut for his family in Dabla mohala near the sea and resolved to start a new life. He along with five other fishermen rented a fishing boat in return for 40 percent of the catch. Dablo and the six other fishermen split the remaining 60 percent among themselves. After some time though, water started rising to Dablo’s new hut too. “I took a loan to construct this stone pitched wall around my hut in order to escape seawater,” says Dablo while pointing at the three-feet-high and two-feet-wide stone pitched retaining wall surrounding his shanty. “I have not been able to return it yet,” he adds with a sigh. Like Dablo, almost every resident of the colony constructed a hut first and later, a stone pitched wall. The residents first construct walls and then begin dumping garbage and building debris inside the walls. When they manage to get enough money, they construct brick houses on these raised platforms to prevent the seawater from submerging their huts. According to Umer Dablo, fishing is only possible during the 10 days when the tide is favourable and even then the total catch sells for Rs8,000-Rs15,000. “The catch has decreased over the last few years too,” laments Diablo. During the months of June and July, when a ban is imposed on fishing by the government, it becomes especially difficult for the community to sustain itself. Families are often forced to sell their belongings to meet their needs. Published in Daily Times, June 30th 2018.